ISLAMABAD April 21 (APP): Minister of State for Information, Broadcasting and National Heritage here Friday said that the political parties which had rejected the formation of JIT, ordered by the Supreme Court were committing contempt of court and while demanding resignation from the Prime Minister they should remember that all their seven prayers have been rejected by the court. She was talking to the media men after inaugurating Furniture Exhibition. The minister said that mandate given to Prime Minister by the people was their trust with him and he would not tender resignation on the demand of the opposition parties. She said that all the international rating agencies and lending institutions of the world in their anodyne surveys and reports had invariably declared Nawaz Sharif as the most endearing leader of the masses and the Pakistan Muslim League (N) as the most popular party of the country due to the measures taken by it for serving the masses and leading the country to the path of prosperity and a sustained economic growth. The minister said that the opposition parties were weary of the popularity of Nawaz Sharif because they knew that if the development projects launched by the present government were completed, it would be impossible for them to compete with PML-N in political arena. Therefore they were conspiring to dethrone his government by foul means, she added. 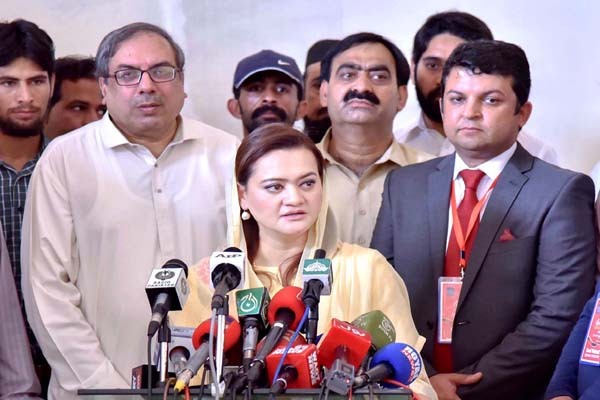 Marriyum said that the politics of ifs and butts should come to an end now and all the political parties must get together to bring an end to the disruptive narrative otherwise the country would continue to face incidents like Mardan and Sialkot. patience and dignity like the one exhibited by Prime Minister Nawaz Sharif in the face of the disruptive politics by some political elements. The minister said that media had played very constructive role in the fight against terrorism and building positive image of the country and it was now incumbent upon it to focus its attention on national issues like highlighting development and progress and discouraging rumour-mongering. She said that Prime Minister Nawaz Sharif had set a unique example in the political history of Pakistan by presenting three generations of his family for accountability and answering questions about their businesses, including his deceased father and children. To a question,she said that the Sharif family had provided record of the businesses of Mian Sharif dating back to 35 to 40 years and if there were any unanswered questions, the Joint Investigation Team (JIT) would be given satisfactory responses. Marriyum remarked that Supreme Court directive for the formation of JIT was an endorsement of Prime Minister’s letter to the Chief Justice regarding constitution of a judicial commission. She reminded the nation that the opponents had used all negative tactics and organized sit-ins, attacked the Parliament House, PTV headquarters and tried to lock down the federal capital, for toppling the government but every time they had to eat dust. She said that the Prime Minister Nawaz Sharif showed utmost restraint and patience against the baseless allegations in a very dignified manner while the chairman of one of the political parties was doing negative politics and leveling baseless allegations against him and his family besides ridiculing the national institutions. She said that PML-N workers and supporters were justifiably offering prayers of Shukrana and celebrating the victory of Prime Minister Nawaz Sharif in the apex court. The minister said that the masses were aware of the development and progress in the country and knew well that their fate was linked with one political leader, called Muhammad Nawaz Sharif. She said PTI had done nothing for the people of Khyber Pakhtunkhwa in four years and had locked the offices of accountability commission of the province to conceal the corruption committed by its ministers. local government elections, and the one in Chakwal the other day , she observed. She pointed out that certain elements were trying to find some points in the SC judgment to play dirty politics but they would not succeed in weaving any conspiracy.. Earlier addressing the inaugural ceremony of the exhibition she appreciated the private industry’s role in boosting exports of the country acknowledging that the furniture industry in Pakistan could rightly boast of maintaining international standards. She said it was the vision of Prime Minister to promote private sector industry in the country and the entire nation was indebted to Nawaz Sharif for the turnaround in the economy which was in shambles when the PML (N) came to power. Now the international lending and rating agencies were unanimous in their view that Pakistan was an emerging economic power and all the macro-economic indicators were very encouraging. She said that CPEC which was a pivotal of the ‘One Belt One Road’ initiative of China and duly acknowledged as a game changer for the entire region was gift of the Prime Minister to the entire nation and as many as 65 countries of the world which would benefit from the Gawadar Port. The minister said that CPEC was in fact extension of motorway project launched by Nawaz Sharif government. She said that such exhibitions were actually part of the development narrative started by the present government and the elements trying to destabilize the political system were in fact working on the agenda of the enemy. She said that the Prime Minister had made the promise that load-shedding would be gone by 2018 and pursuant to that pledge a number of power producing projects have been initiated and Bhikki power unit was one of them.